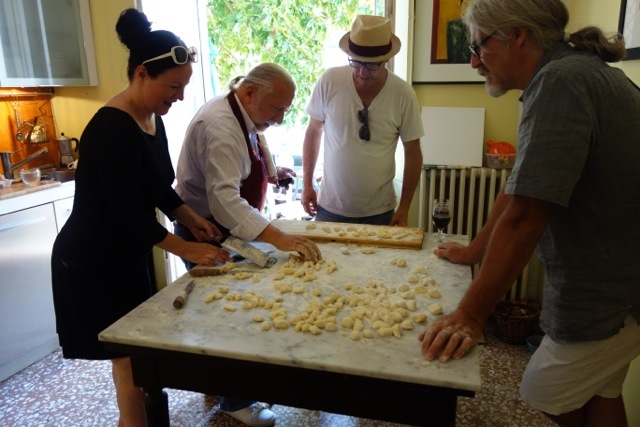 On one of those magnificent lunches we were invited to during the sculpture symposium, we ate a most delicate and delicious homemade gnocchi at the home of Candido Martinelli in Montefegatesi. 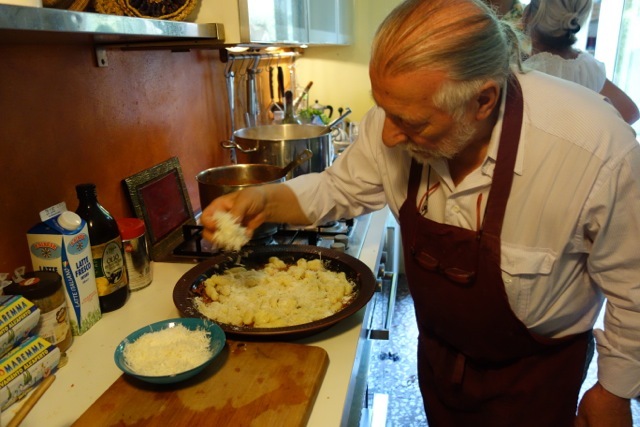 Candido is one of the artists at La Rondine Gallery. 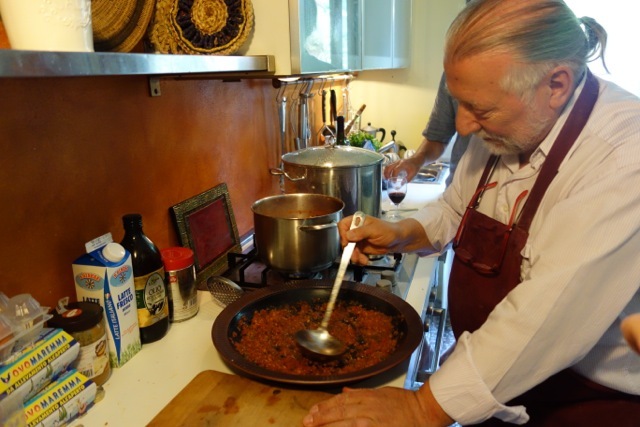 So rapturous of the melt in the mouth texture and yummy homemade tomato sauce, we were able to convince Candido to give us all a lesson on making it in our studio. 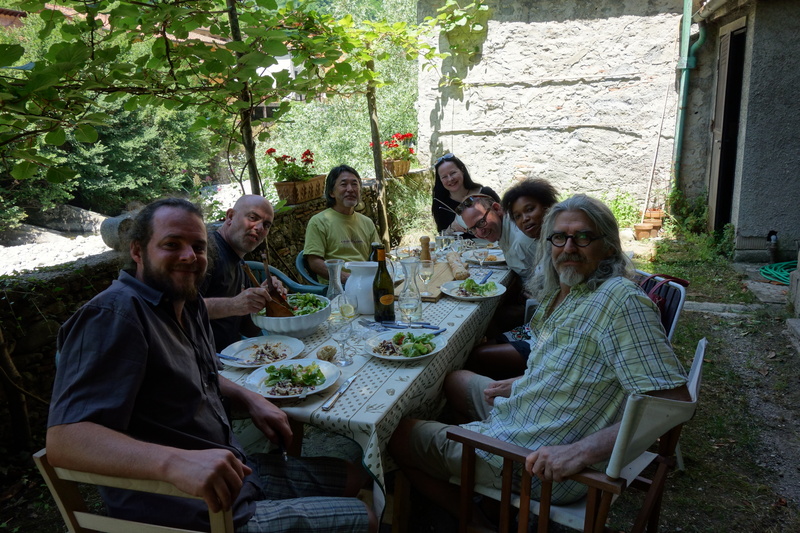 He came down to Ponte last weekend, the final weekend of the symposium and it became our last beautiful meal together, although Ryoichi had already gone. 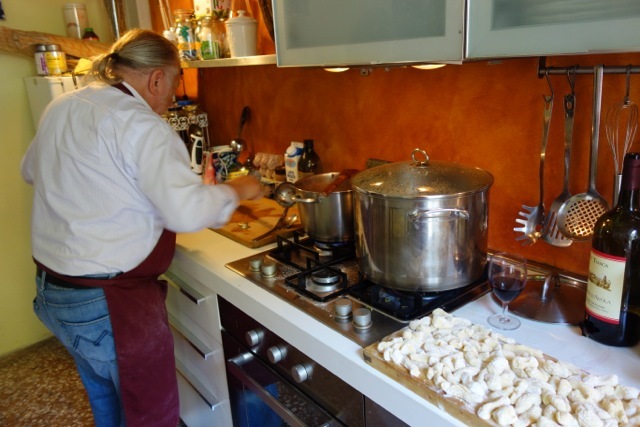 The first thing you put on the stove is the tomato sauce and the potatoes to boil. 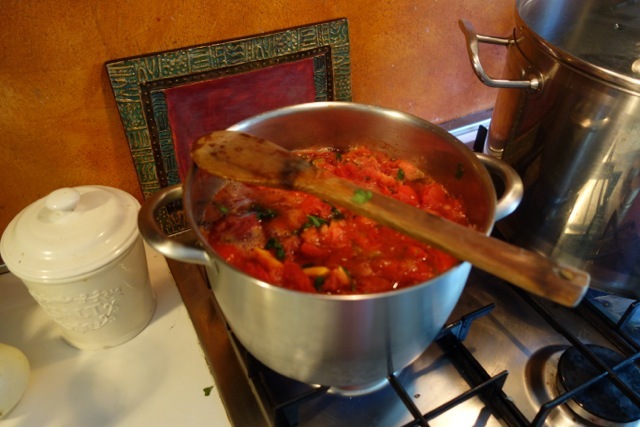 So, you must have a couple of kilos of fresh very ripe tomatoes, we used Roma tomatoes, onion, garlic, chillis, celery, carrots, parsely, oregano and basil. 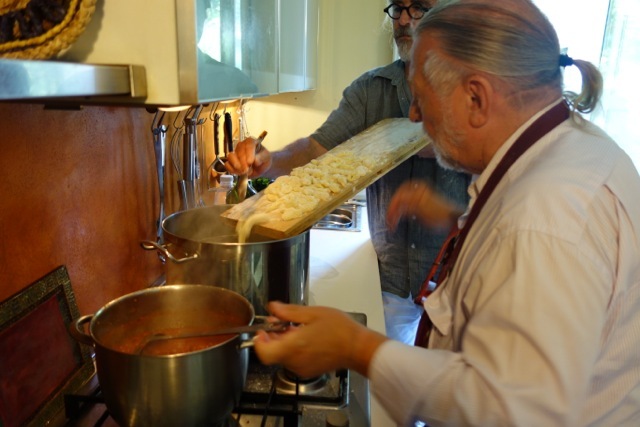 The carrots give sweetness to the sauce and as they are roughly chopped up, not small but chunky, when they are finally soft and mushy a couple of hours later, they are the true indicator of the readiness of the sauce. 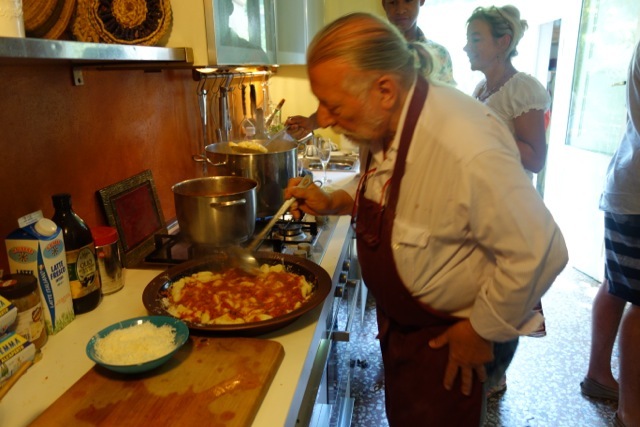 Candido just roughly chopped everything up and put it all in together with some olive oil and let it stew. 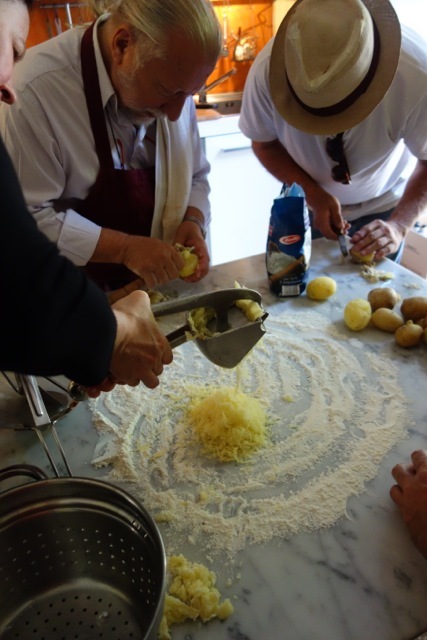 While we were making the tomato sauce, the potatoes had been put on to boil, two medium potatoes per person, left in their jackets and uncut, salted with rock salt as it hasn’t been bleached and therefore the best flavour. When they were tender but firm, we drained them and plonked them on the table to peel before pushing them into a giant garlic crusher. 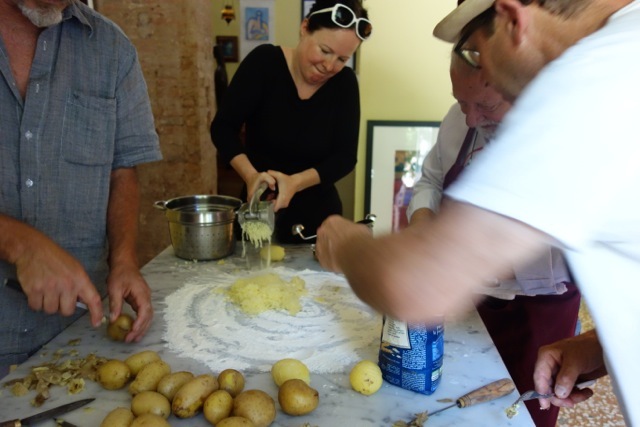 The potato squeezed out like spaghetti onto the marble top table and was mixed with plain flour, a well made in the middle and eggs cracked into it. One egg for every four people. 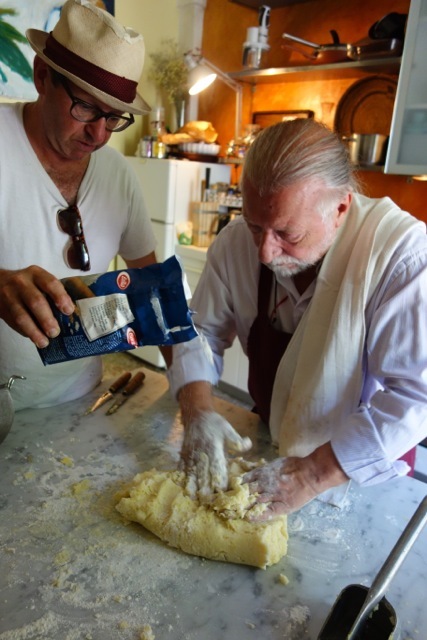 Flour was added regularly and it was kneaded till it felt like bread dough. Then it was divided and lightly rolled out on the table into long snakes about an inch thick that we then cut every half inch. This is not the end. 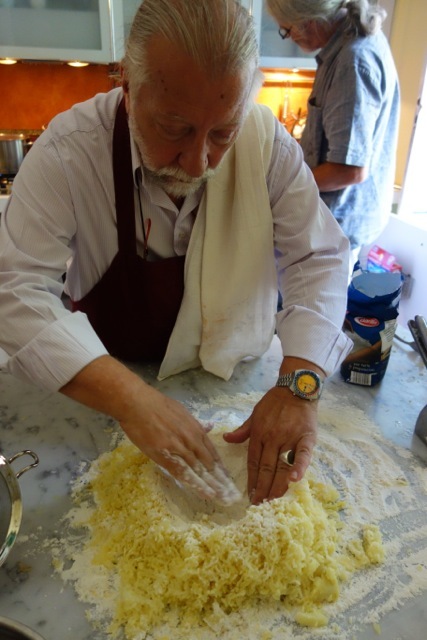 Candido then pulled out a curved cheese grater and tried to teach us, (this was surprisingly difficult), to roll the little gnocchi along its surface lightly so that not only did its surface puncture but the rolling created a cavity or a curl in the centre – this is the secret! – that hollow middle makes it incredibly light. Ok! 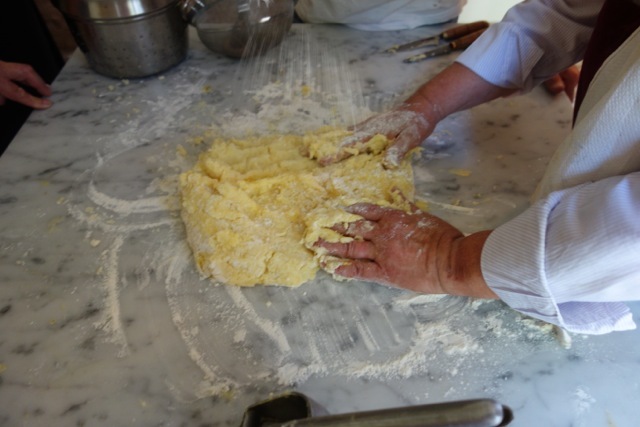 So now the gnocchi is laid out on floured boards while the water boils in an ample pot, a couple of table spoons of rock salt, no oil. The stewing tomato sauce is ready to attend to as the carrots are soft and mushy – all the flavour is out. 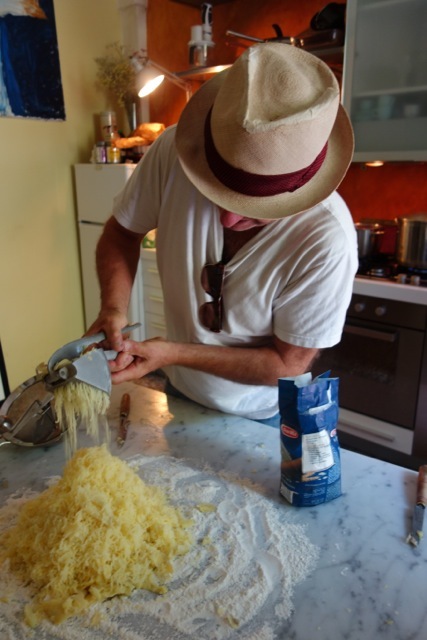 We had intended to put the sauce into a mulli grinder but we lost one of the pieces so it all went into the food processor for a light blend, still keeping the texture. 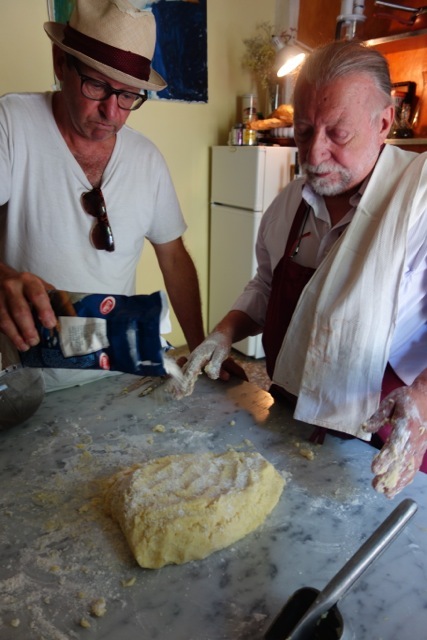 The water is boiling and in go the gnocchi. When they rise to the surface they are ready. 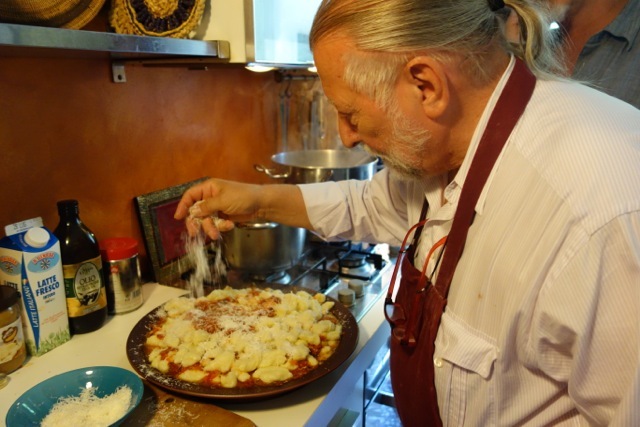 Candido put a couple of spoonfuls of sauce into the bottom of a broad dish and then, with a holey spoon, scooped up the gnocchi on the surface of the bubbling water and placed them gently into the sauce, a layer of parmesan cheese, a layer of tomato sauce, a layer of gnocchi, and repeated until all the gnocchi is finished. Spectacular! This with a caprese salad of fresh garden tomatoes, basil leaves and buffalo mozzarella drizzled in the best local Lucchesi virgin olive oil and a bowl of green fresh lettuce out of the garden, hmmm yum! 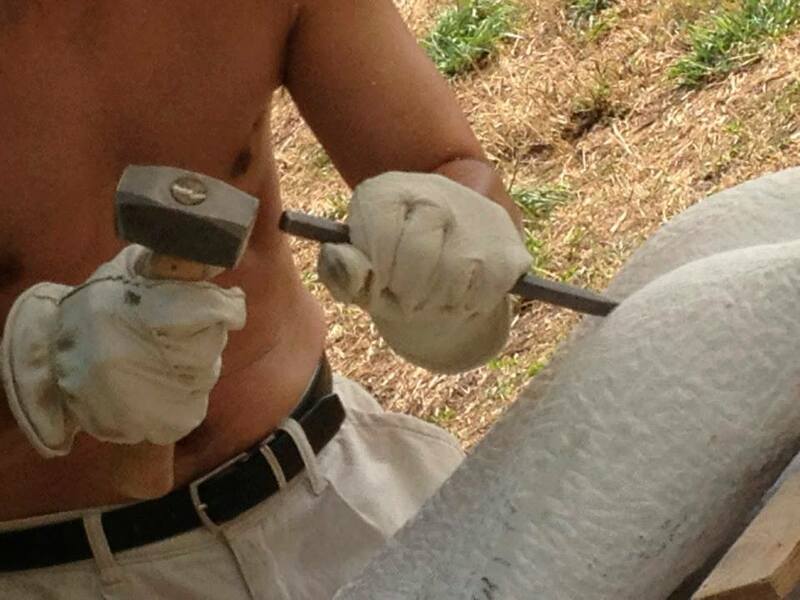 The sculpture symposium is over. The artists, one by one are leaving. Sad to see them go. They became like family, bonded by big family meals, heart to hearts and animated discussion. 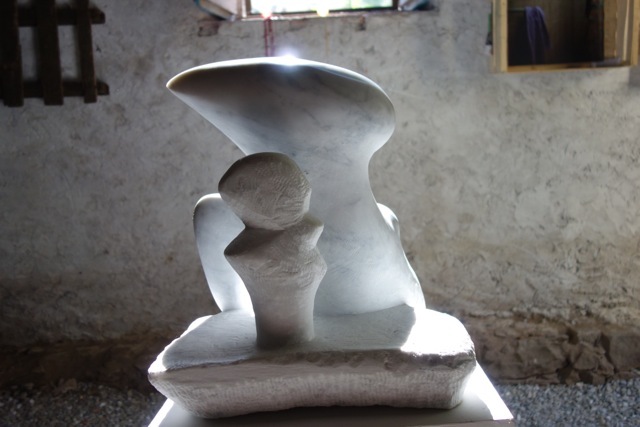 Their works were exhibited in ‘La Cantina’ and garden in Ponte a Serraglio on the weekend in the golden ambience of a summer’s evening. Every day since the first of July you wander over the passerella to the Villa Fiori gardens and you hear the musical tapping of metal on stone. 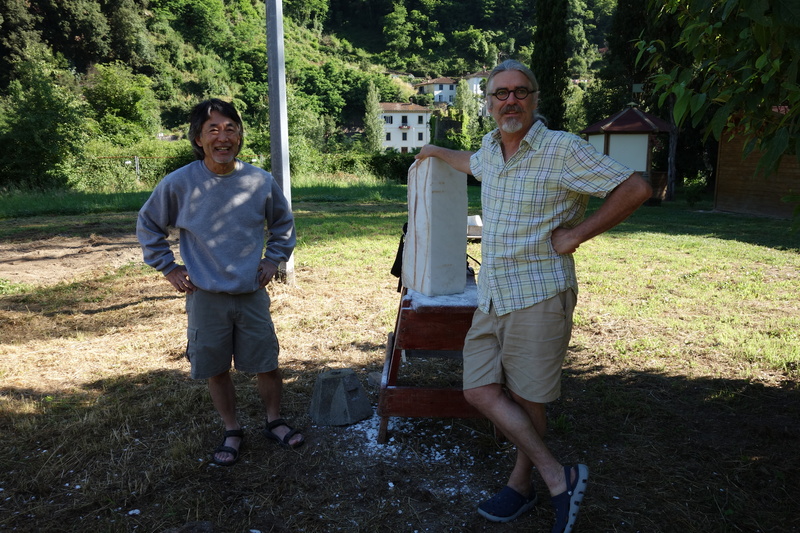 The sculpture symposium, one of the many wonderful events of the Bagni di Lucca Art Festival, has seen the works of five sculptors evolving and ‘becoming’ over the month; Doug Robinson, Sarah Danays, Ryoichi Suzuki, Petra Boshart and Michael Cartwright. 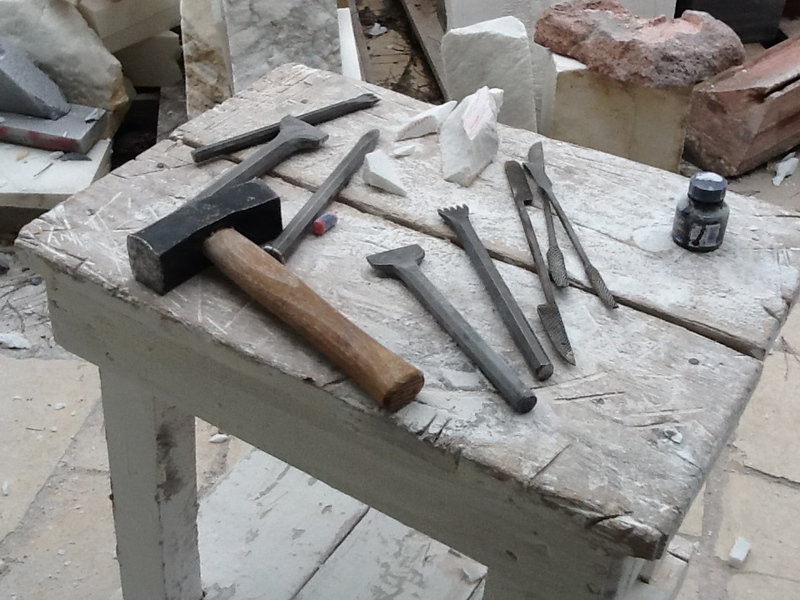 Visitors to the gardens have been delighted by the progress and information on how each artist develops their language, using only hand tools on various types of marble, statuario and normale from Carrara, red travertine from Iran, nut brown from Turkey. 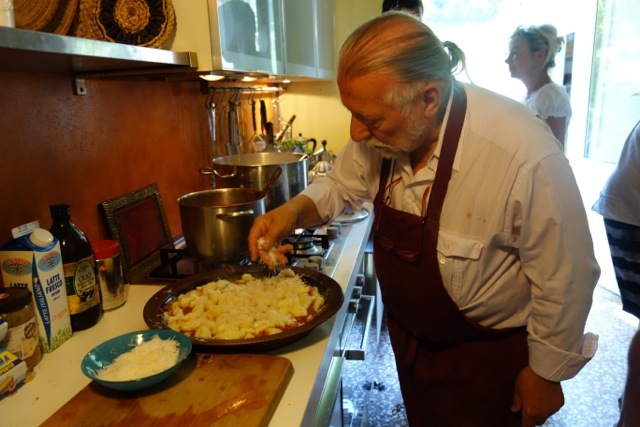 Every day the local people have provided lunch for the artists in their homes. It has been an enormous discovery for the hosts and the artists alike to see how the other lives life. 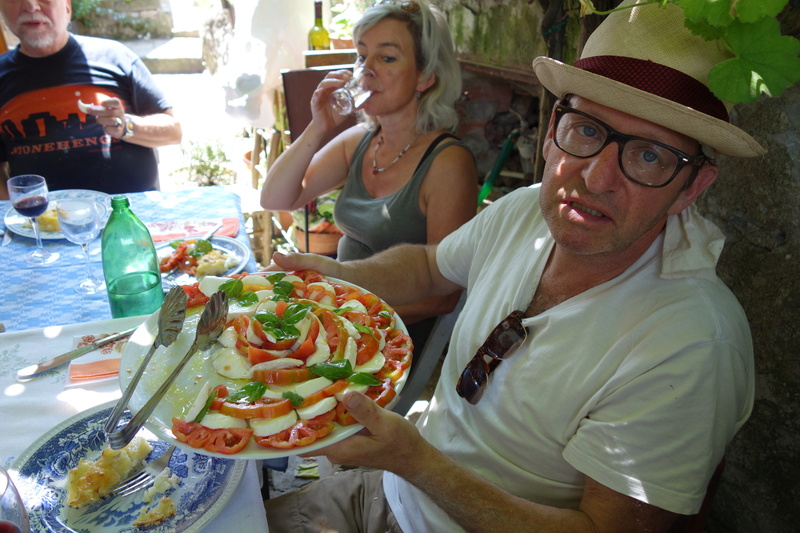 There have been lunches in tiny kitchens and under vines with magnificent vistas, every lunch generous and fundamentally Italian, with pasta and wine and home done olives, good vegetables from the fields and heavy rustic breads and cheeses. The kindness of Hotel Pio in Bagni Caldi, donating rooms to three of the artists for the full month along with the Bridge Hotel in Ponte a Serraglio hosting Doug, has been a huge act and earns them the name of the ‘art hotels’ and maybe next year with funding they will be well recompensed. 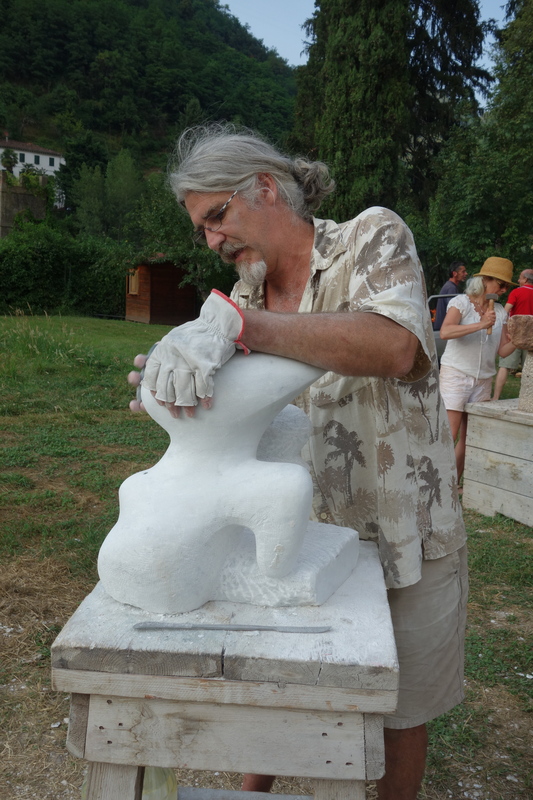 Doug Robinson is a Canadian sculptor who has been coming to Pietrasanta for the past thirty years to carve marble. 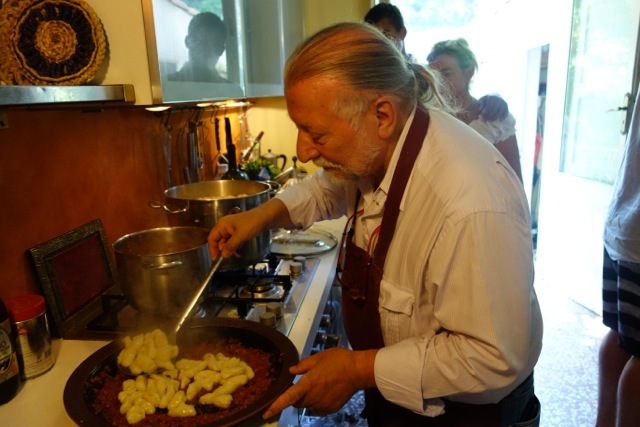 He has been a wonderful joy in the party, his enthusiasm for the whole culture of Bagni di Lucca with all its hilltop villages, his eyes turning into childlike buttons of wonder have made us laugh and enjoy being here even more. 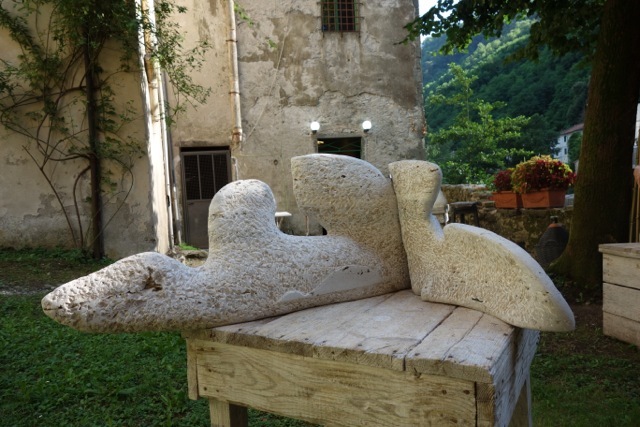 He has been working in the brown travertine and his work, organic, figurative, animistic and landscape, all, are a beautiful testament to his surroundings that he has eagerly absorbed. 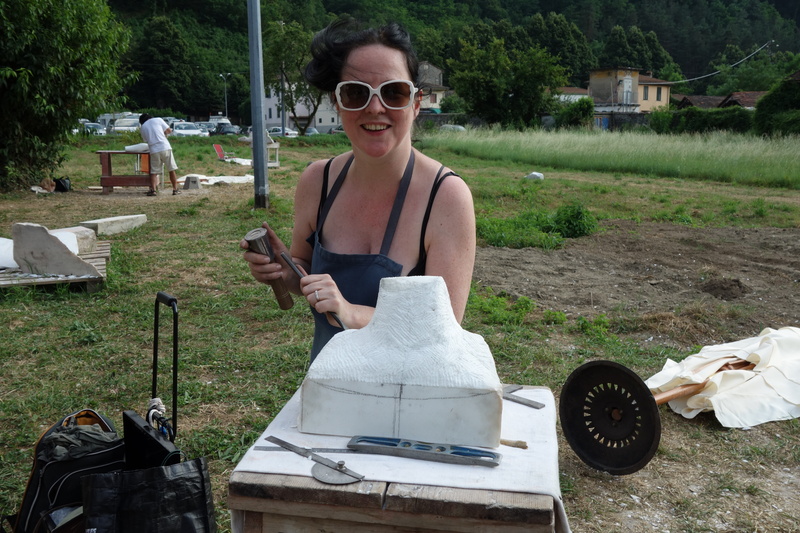 Sarah Danays, a UK artist living and creating in L.A. and renovating a house in a little hilltop village here in Bagni, is a petite and gentle woman. 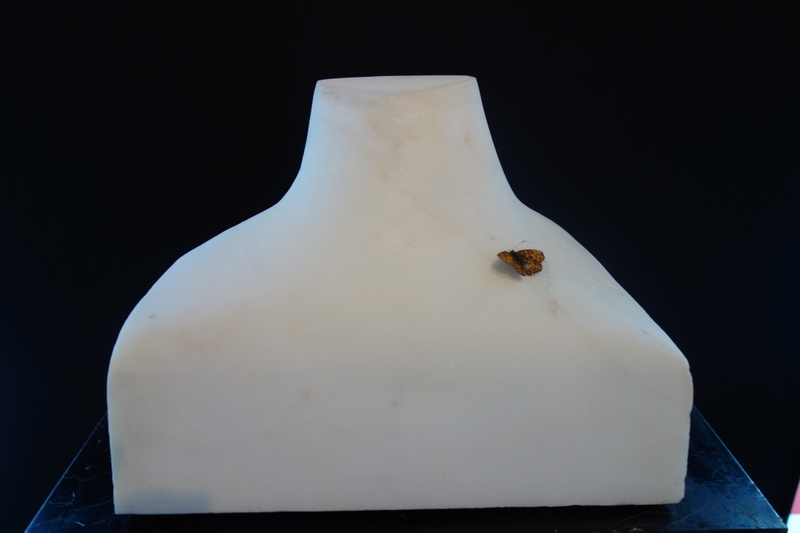 She has carved the smallest piece of marble to carefully and delicately create a bust to wear the adornment of an antique necklet which will then be melded into her own artistic expression of a photographic installation. Her lovely kind presence, always caring about us all and deeply concerned for her sponsors that they are properly acknowledged, has been significant to the warmth and friendship of the group. 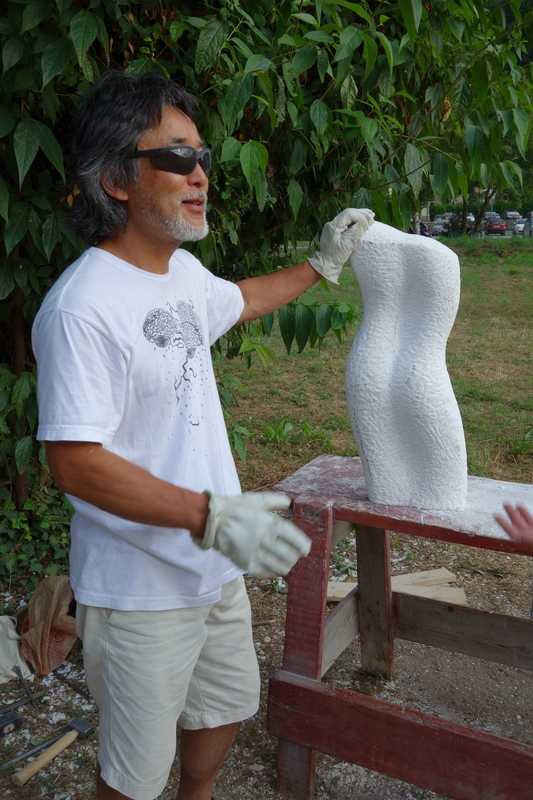 Ryoichi Suzuki is a Japanese artist who has lived since his student days in Utah, USA, where he now lectures as a teacher in sculpture at the university. 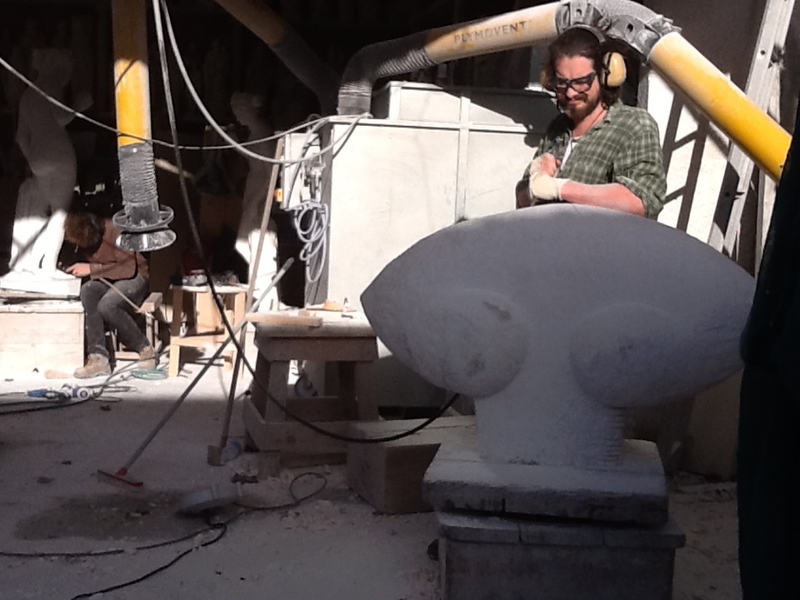 He has been used, as a marble sculptor, to the machines of the trade so has encountered a learning curve with the hand chiseling as has nearly everyone in the group. 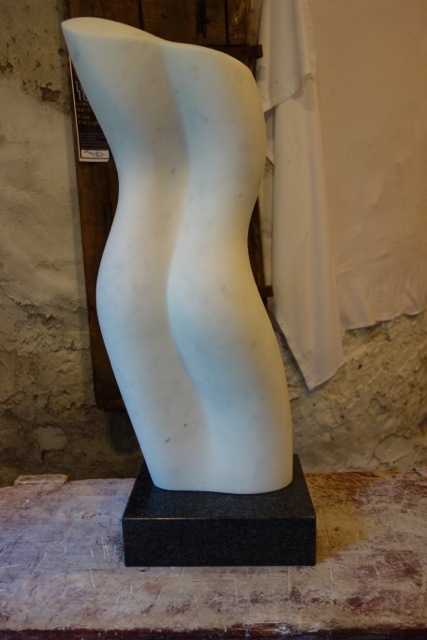 His process has been very methodical and at the end of his stay here he has created an abstracted silken torso in the white Carrara marble. People in town have loved his open interest in them and enjoyed his jovial company in the bar. 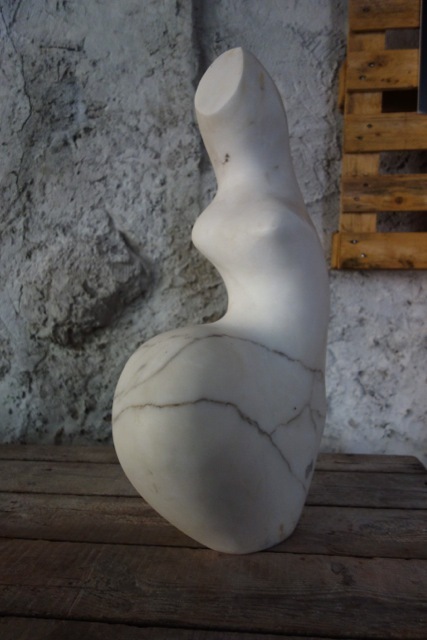 Petra Boshart, an artist from the Netherlands, comes from a long respected family line of marble carvers. She has willingly shared lots of tips from her memories of her grandfather and father and has delighted in the hand carving process which has eliminated lots of the aches that sculptors acquire from constant use of machines when carving. Carving on the edge of the Lima River inspired her sculpture in the Iranian red travertine, an organic coil of rolling form reflecting the flow of water. 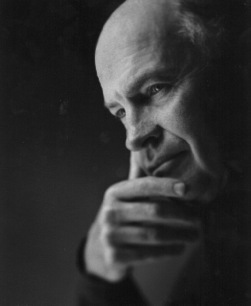 Michael Cartwright, has loved being in the field every day creating. Life has been incredibly busy, because living in the same place you are working in, means many distractions, including hosting his sculpting friends every evening after work. But Mike’s energy is huge and he attacked his cube of stone with velocity before it took its shape into an abstract quirky bird form with what he calls the nest. People walking in the gardens each day got to know it and delight in it which was lovely for him because it usually takes a while for people to know his work. 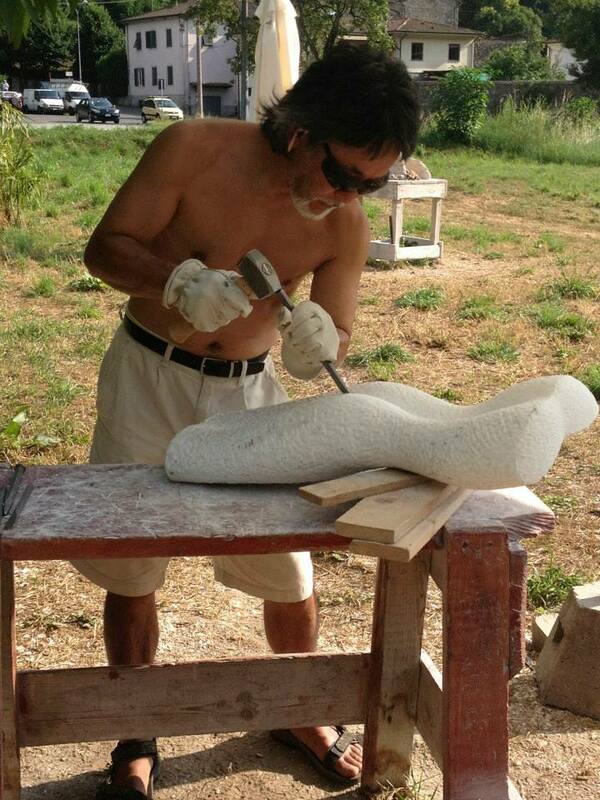 He is working on his second piece now, a promise of a gentle fluid form that feels womanly. 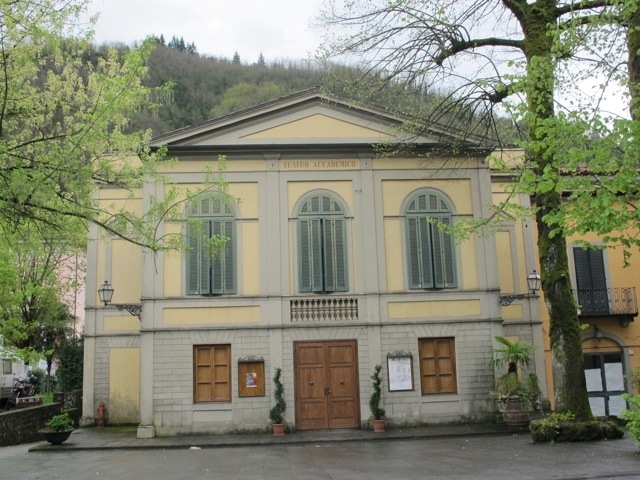 The artists will be showing their work on May 26th, when hopefully the road in Ponte a Serraglio will be closed again and all the shops reopened with the next exhibitions. Colour must be the story of India. I wanted to see more. I wanted to be overpowered by it as you are when you go to India. 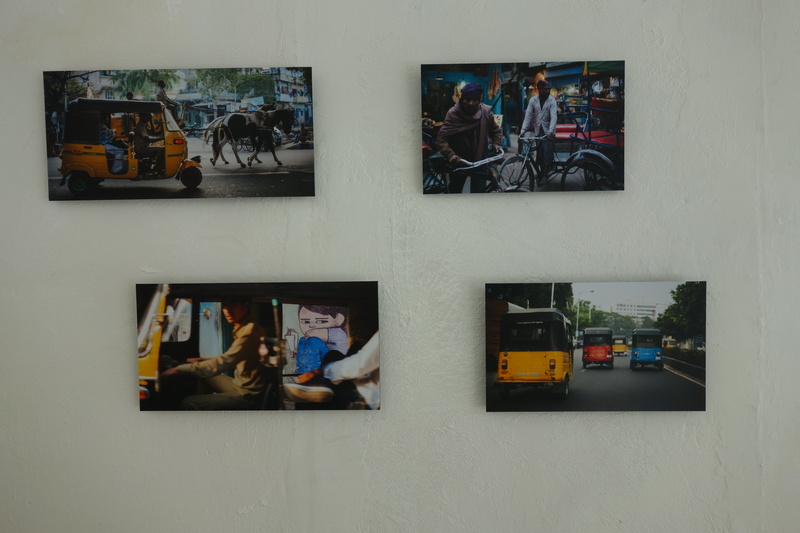 The taste of it was yummy, a glow in the light, exotic fabrics edged in gold, the haze of dust, the flamboyant twists and turns of architecture, crumbling…The opening night to Ella Haller Zwierzchowska’s exhibition of photography, ‘India, The Extraordinary Everyday’ at La Rondine Gallery, was a beautiful celebration on a fine early summer’s evening. 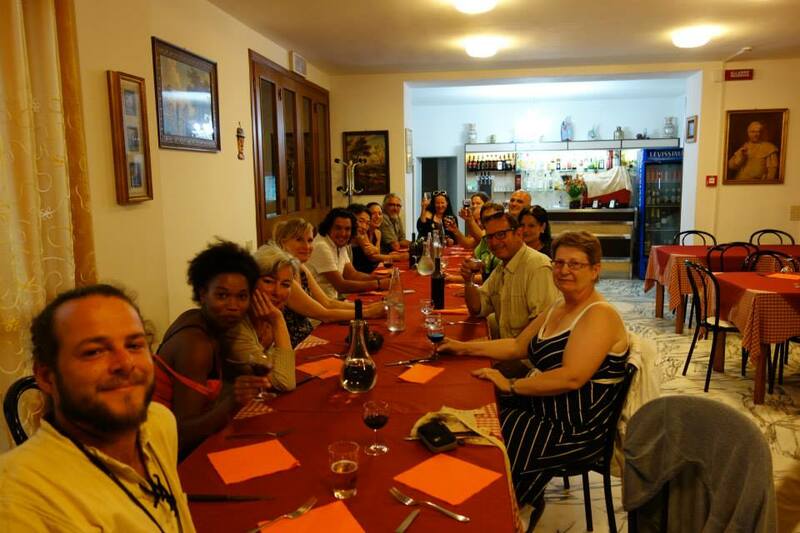 People came and went all night, really looking at and enjoying the work and sampling the tastes of Indian cuisine and chai; wine secondary to the pallet that night. We have been watching Ella’s work over the past couple of years as she is a prolific photographer with a very good eye and she keeps her friends informed of her work on Facebook. Although she is only twenty one, she has been doing photography with a passion since she was ten when she inherited her first camera from her grandfather. The hours are certainly growing in her work and there is a suggestion now that she will take a decisive direction. 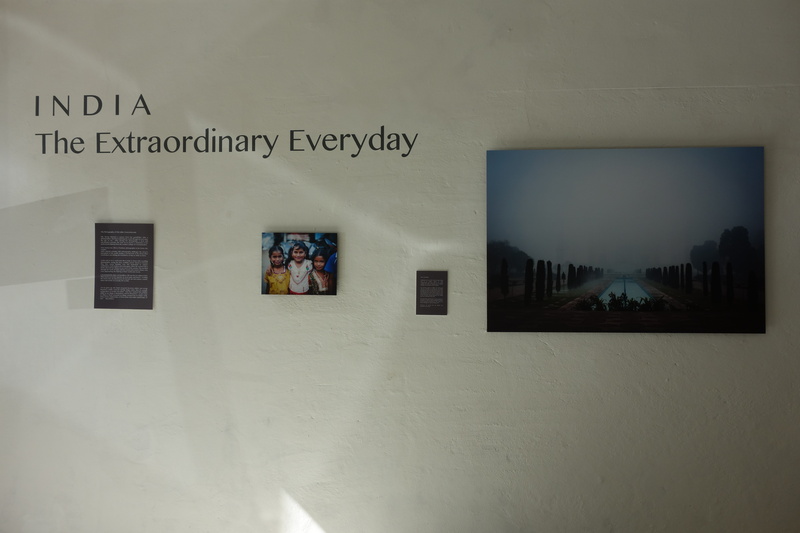 Around the walls there are little stories connected to the photographs she took and for many people, they are brought in close to the experience of subjectivity with her work. 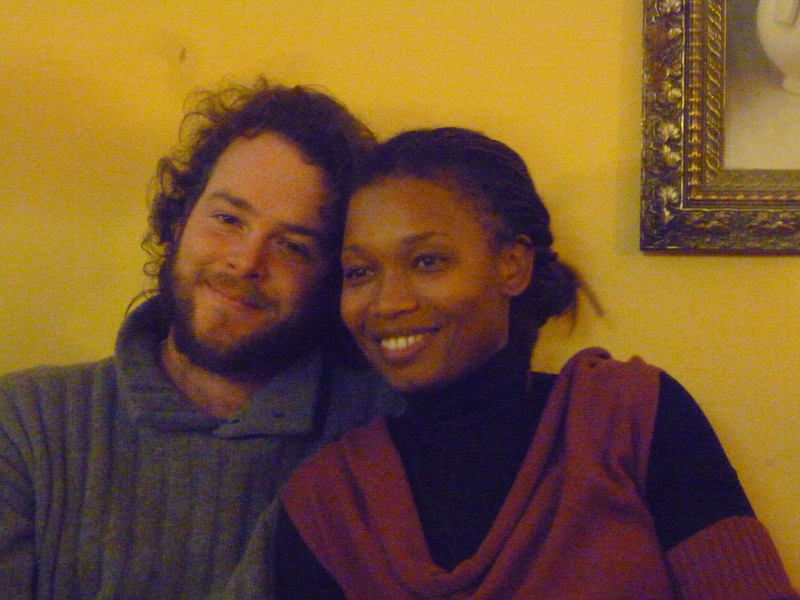 For Michael and I, being visual artists, the impact for us is in the visuals not the story. I found that what interested me was her quirkiness, her ability to create an abstraction or ambiguity from a fleeting moment, like in the image, unnamed, of the taxi driver in his open cab glancing sideways at her taking the shot, while the cartoon poster in the passing background reflects the driver’s glance and abstracts the whole image with its play on the real and the comic. She has a camera constantly in her hand so it seems that these brilliant moments are caught by her prolificity and accustomed eye. The primary colours of the identical taxis, yellow, red, yellow, blue, on the road before her on one of the shots; in another, the horses in the background drawing an unseen cart that look like they are pulling a little motor driven taxi, that is actually in front of her vision. 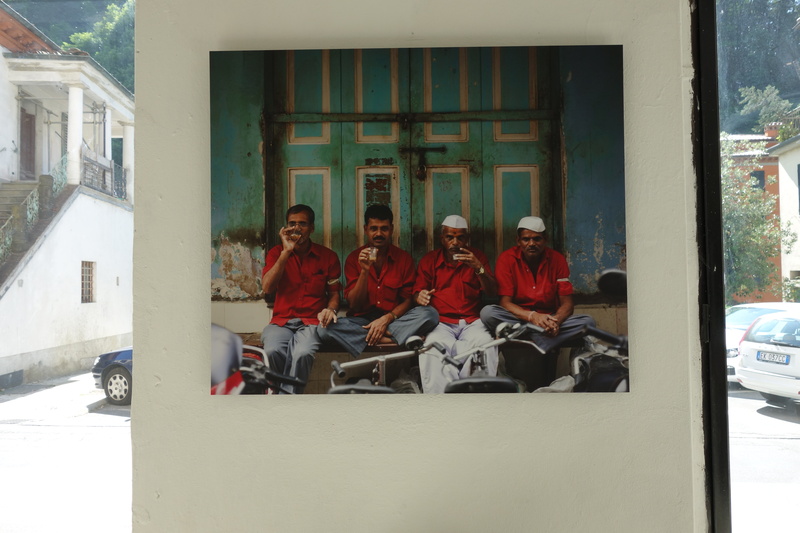 Then there is a lovely found moment in the four taxi drivers in red, sitting in front of four green doors elegantly sipping their chai, a vivid capture of contrasts. Her two portraits of brides were gorgeous. 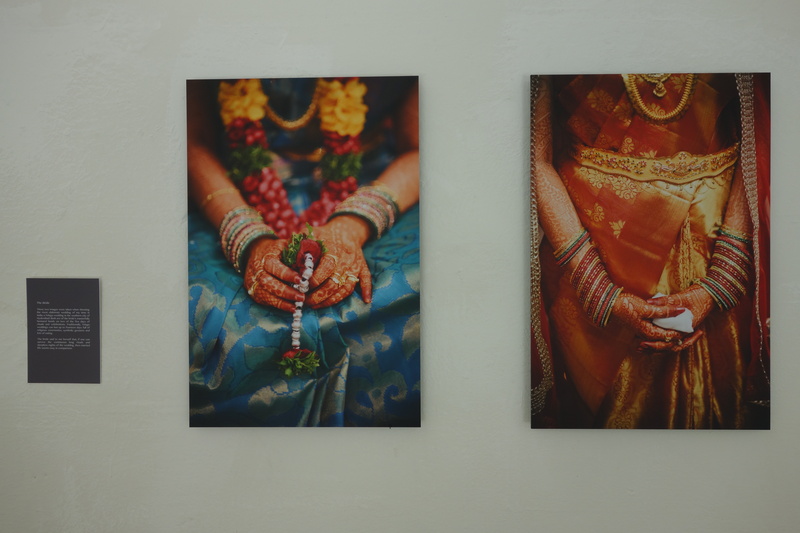 The portrait was in the beauty and glow of the colourful silk costumes and the henna tattoos on the gently clasped hands reflecting the magic of the moment and the importance of the event. And the Taj Mahal, unseen, sheathed in mist as luminous as the Taj Mahal itself. I sense in Ella’s photography, delight in the capture of the moment. Her photographs are of exquisite magical and ambiguous moments rarely captured and remembered in life and her dedication to materializing them through her work seems to be where her artistry lies. 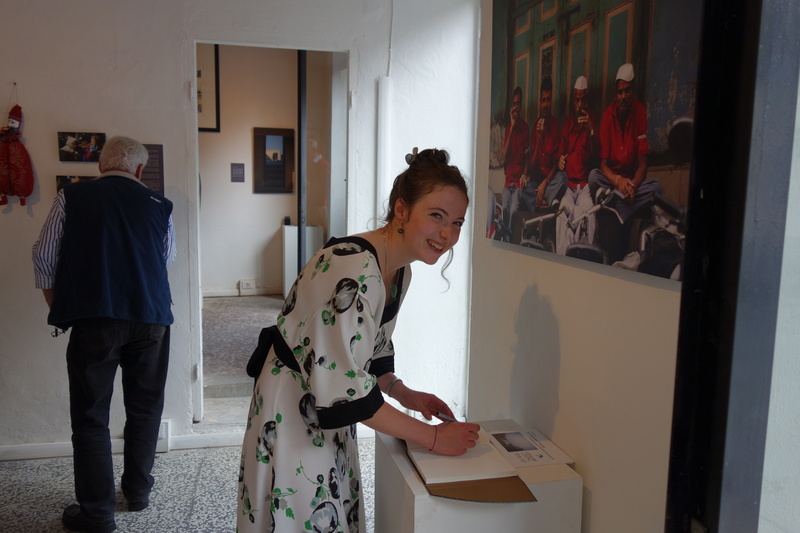 We are so glad Ella took the opportunity to show her work at La Rondine Gallery. We love seeing young artists take the leap of commitment and faith to their art and Ella has taken it with arms out wide. 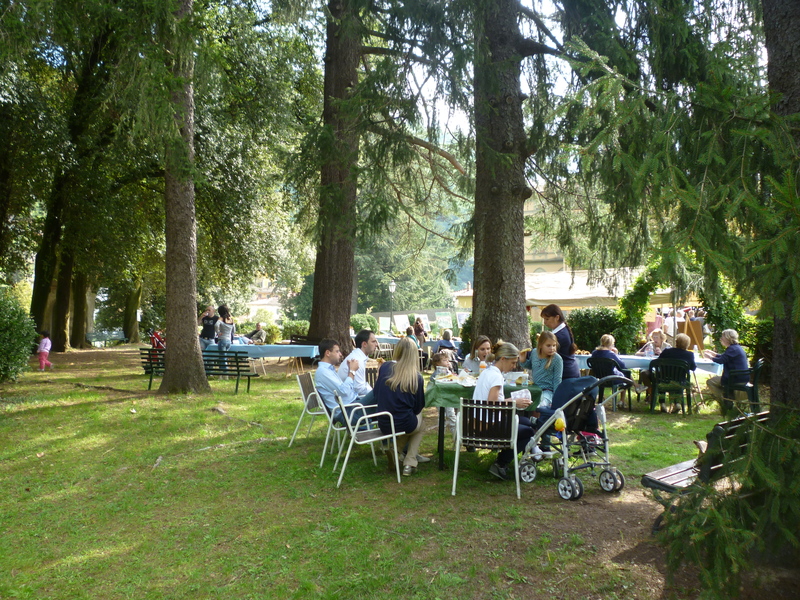 On a late summer’s day last year, under a pergola dripping in wisteria and overlooking splendid vistas, a thought was born to a philanthropist and his friends, to have an art festival in Ponte a Serraglio. For years we had all been coming here, and every year another one or two shops would close down. It seemed unbelievably sad that such a beautiful and elegant town with such a salubrious history should disappear, becoming shabbier over the years and less and less inviting to visit. As with all intrinsically beautiful places, artists are already attracted to this town with its gracious old buildings and surrounding mountains and walks up to the ancient spas. 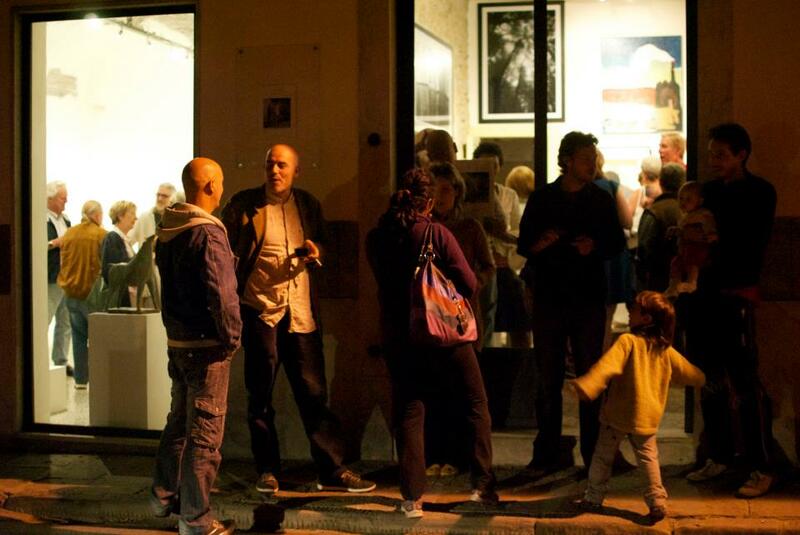 An artist group got together on the bridge, taking over two shops some years ago, Artisti Uniti, of around ten artists. 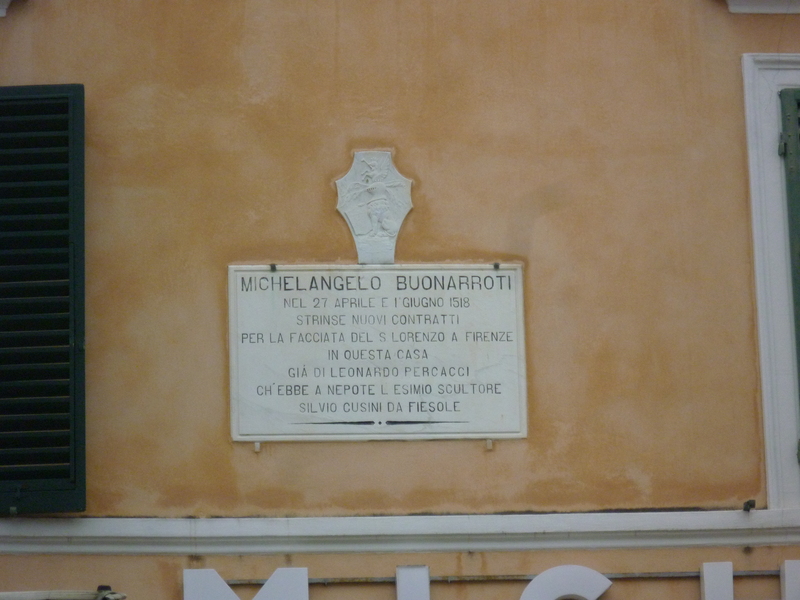 It was shortlived but quickly followed by the Borgo degli Artisti, whose initial group had a dream to create a hamlet of artists, inspired by Greenwich village in New York! The Borgo degli Artisti took the initative to fix up the derelict garden of Villa Fiori, making it a gorgeous place to have a painting event in mid July, attracting nearly 100 artists for the day to paint all along the river and now they also have sagras on that day and other days throughout the year and have a little gallery on the bridge that displays their members’ works year around. 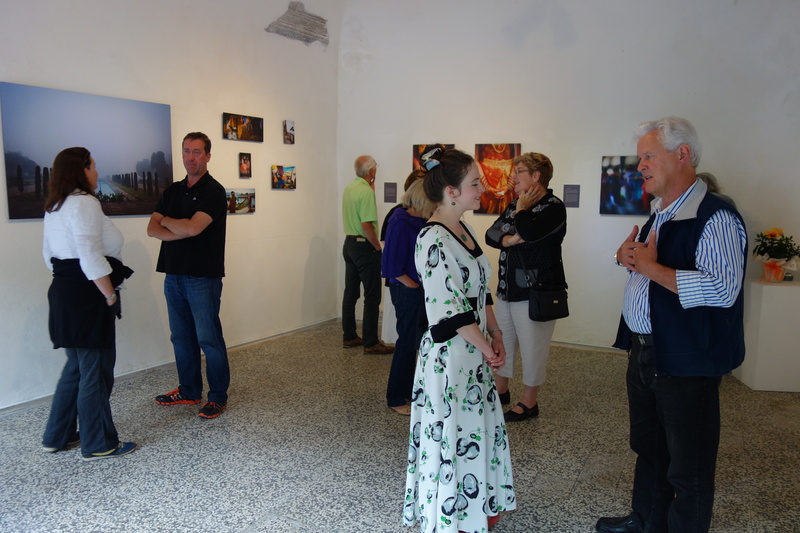 Since the Borgo degli Artisti started, La Rondine Gallery, an artist run space, showing international artists throughout the summer months has opened in two beautiful shops on one of the small piazzas. 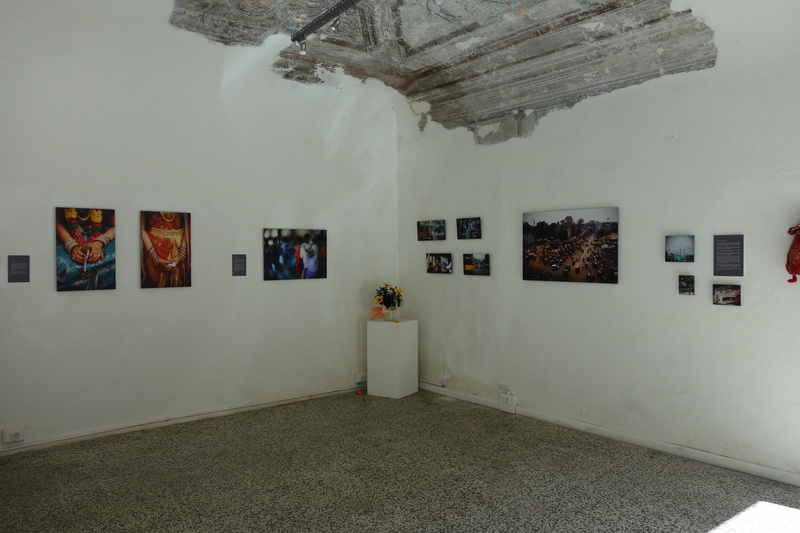 To add to the general feeling of excitement, a photography gallery directed by Kevan Halson is opening a few doors up from La Rondine and will feature the works of international photographers. 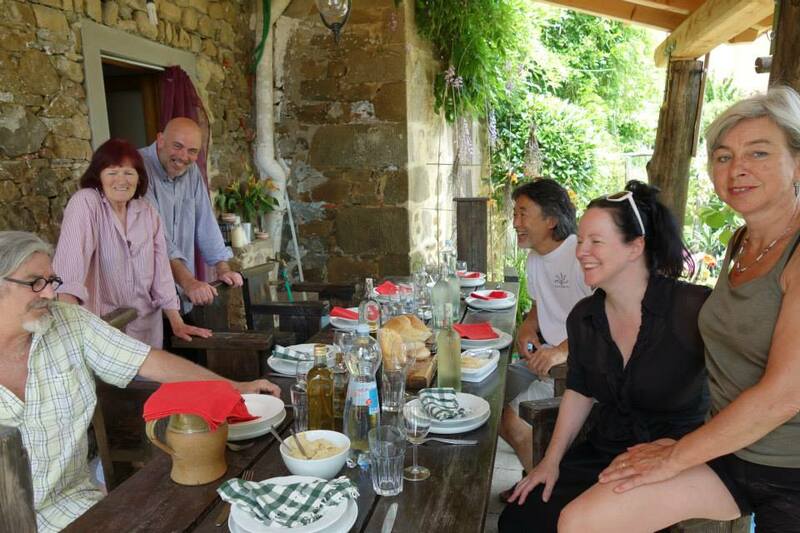 After our informal ideas meetings with our philanthropist friend who donated a substantial offering to the cause, the enormous job of putting together the Bagni di lucca Art Festival, was placed in Jaqueline’s hands. Jaqueline is our daughter-in-law married to our eldest son, Jacob. Her mother has a smile that would light the sun, while her father is a politician in Cape Verde, and we’ve decided upon this knowledge that the apple doesn’t fall far from the tree. She is extremely talented dealing with so many artists and cajoling so many people to donate their empty shops, encouraging everyone in the town to get out and work at cleaning them up. The feeling of anticipation is palpable. Already the festival, even in its first year, has legs that are running for success. Of course she is greatly supported by Jake, and the two of them have become a wonderful team. 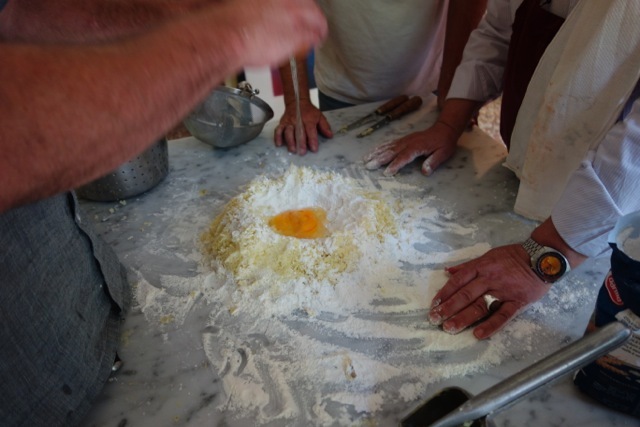 In generous collaboration, the Borgo degli Artisti are delighted to have the art Festival take place throughout the Villa Fiori gardens. 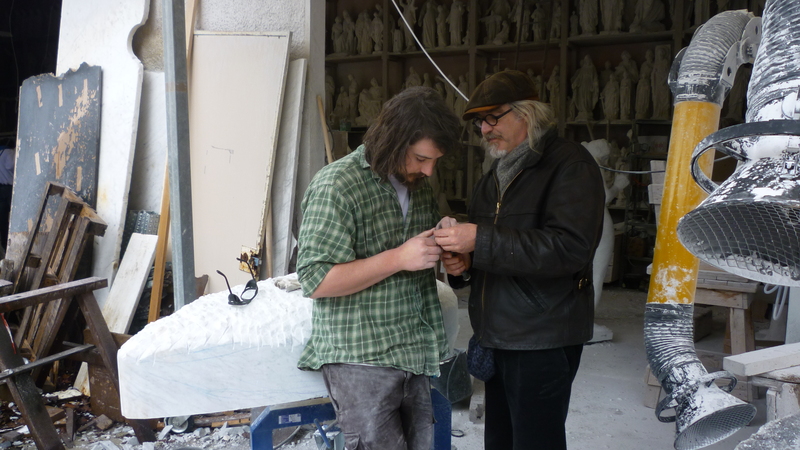 Starting at the beginning of July, there will be a marble hand carving sculpture symposium with international sculptors; music performances; opera; acrobatics; dancing. Plus, there are 7 or 8 empty shops that have been seconded and they will be artists’ studios/exhibition spaces/installations. These shops will rotate with artists over the entire summer, June through till September. 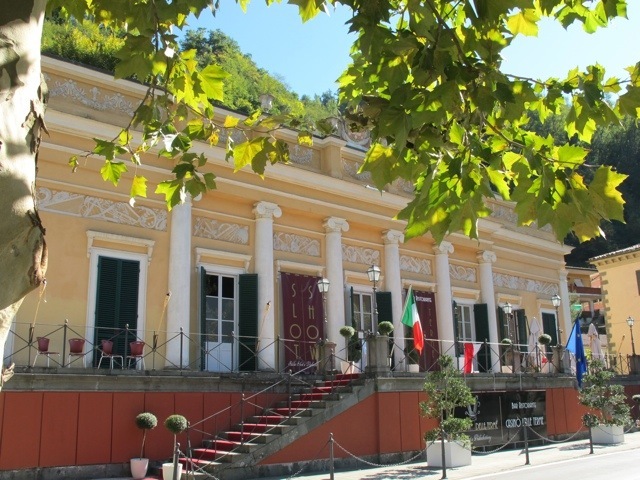 The scrumptious old casino will be transformed in the summer for a piano recital of Lizst by one of Australia’s foremost pianists, Ronald Farren-Price, also for an opera from London and an opera from Lucca as well as a performance by Italy’s Al Maranca. It’s a growing happening and already people on the other side of the world are booking to come over to be here, enticed by beauty and culture and delightful traditions. The Bagni di Lucca Art Festival is the manifestation of many dreams in the little town to see it thrive once more. After all, its historical interest has always been through the amazing artists and personages who have visited this town in the summer. 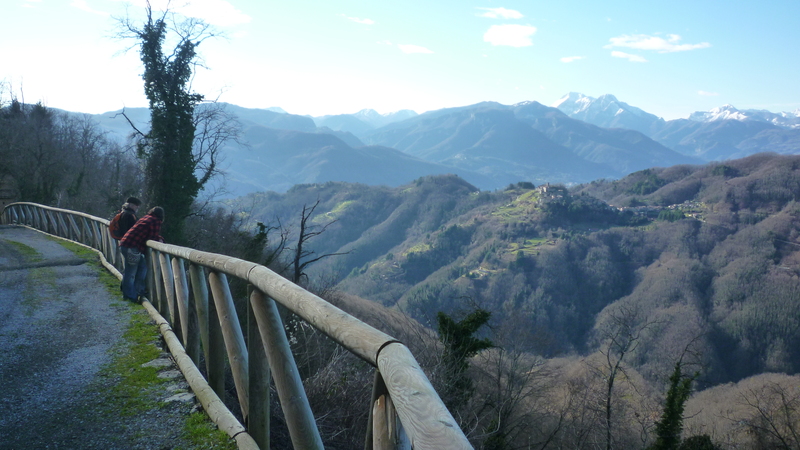 Sollai, our youngest son, arrived in Bagni di Lucca just before Christmas last year after a year in Montreal with his acrobat girlfriend, Danica. 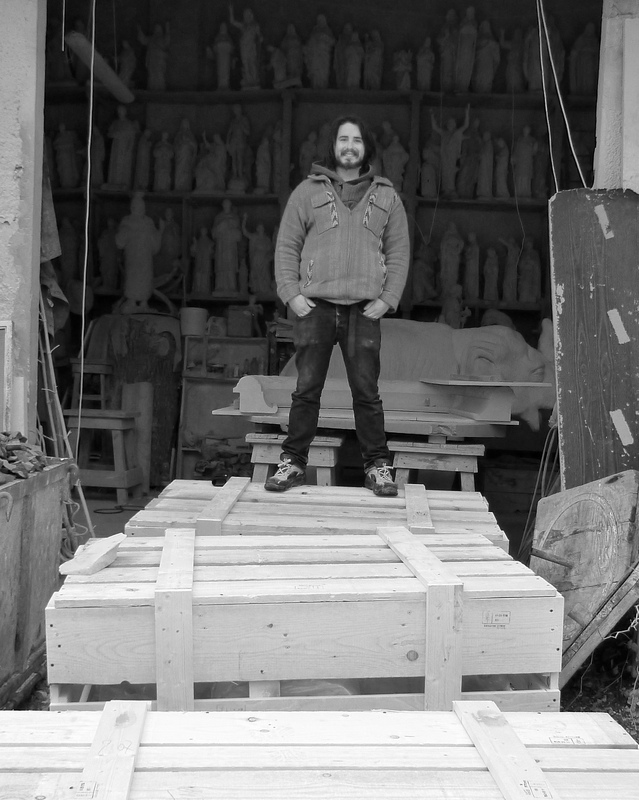 He had spent the year working on log cabins, stone chimneys and gardens up around the lakes and creating his sculpture carving alabaster and marble, in his city studio. Even though the experience was wonderful, bringing him in contact with an abundant wild life and contributing to the language of his art, trying to make money to live and still do his artwork frustrated him enormously. 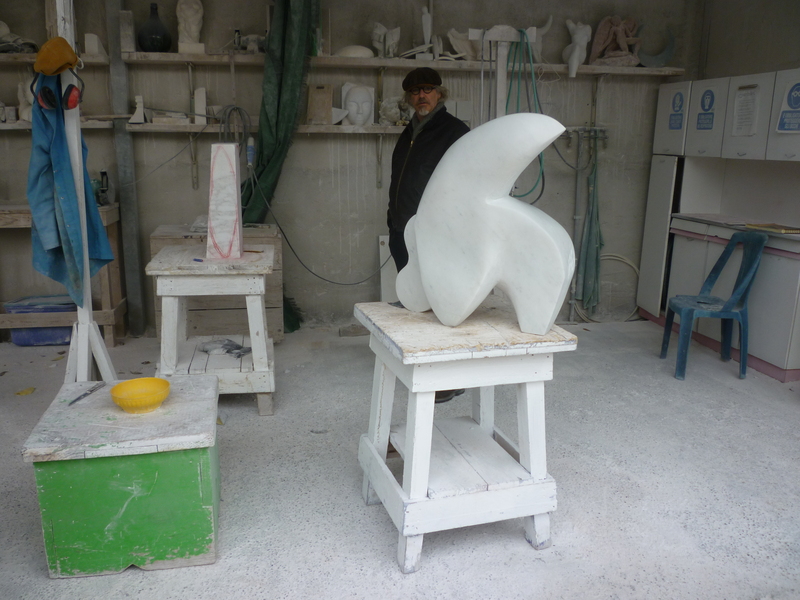 Then, to his enormous good fortune a lovely collector was encouraged to sponsor him in Italy to carve in one of the most renowned marble carving studios, La Cooperativa, in Pietrasanta for three months over the winter. Lucky Sollai! He was given accommodation, studio, stone, allowance and tools in exchange for artwork created there. 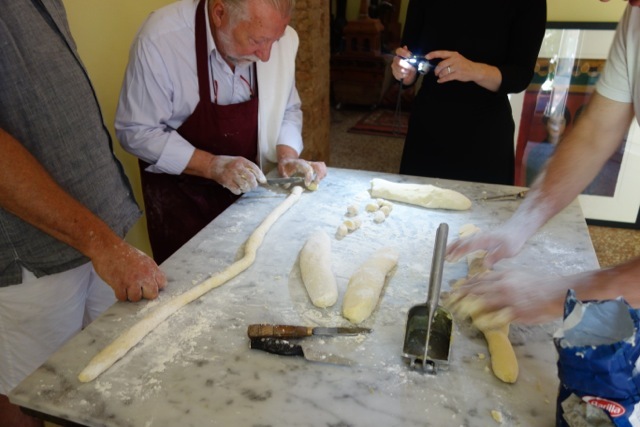 More importantly, he was in the mecca of marble carving and had access to the knowledge and advice of some of the most experienced artisans in Pietrasanta – or in the world. 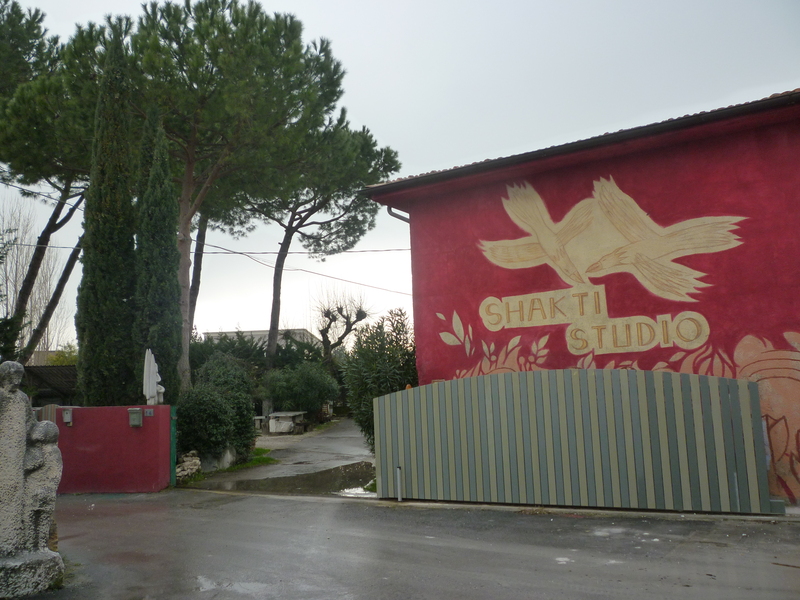 Michael, at the same time, took the opportunity to be with Sollai and rented a studio space in Studio Shakti in Pietrasanta for a couple of days a week. 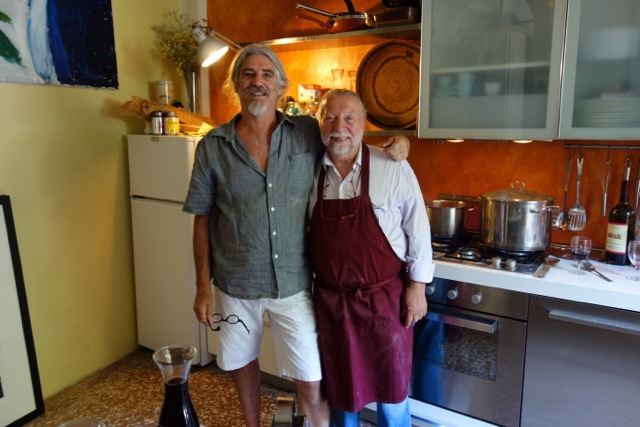 They’d meet up for lunch in the Croce Verde where they would devour a huge three course lunch with wine, water and coffee for ten euros each. After work they’d find a little bar to hang out and relax in, warming up after a long day in the cold. Mike got some great work done. 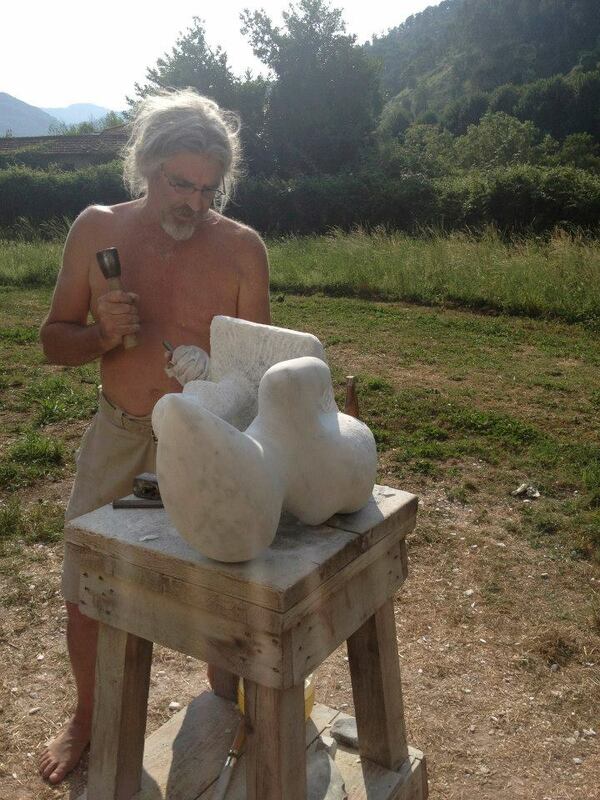 I think he was a bit rapturous to be carving in marble again after so many years since the car accident when he was unable to do any heavy work. He actually forgot in his enthusiasm, the weights of stone. An average size piece, 90 x 90 cm, weighed about 180 kilos, fully realized when it came time to move it. 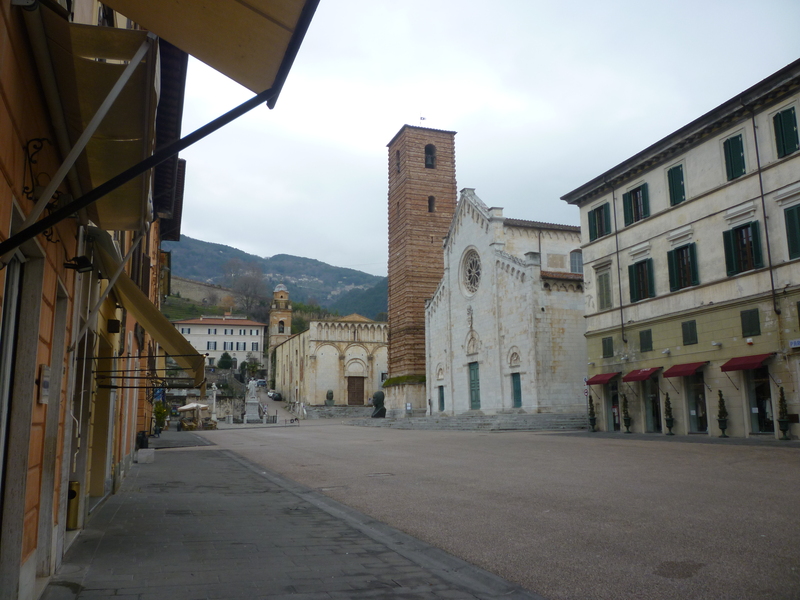 On one of the days returning to the studios to work after a weekend in Bagni di Lucca, Mike took Sollai up over the mountain pass from Castlenuovo to Pietrasanta. 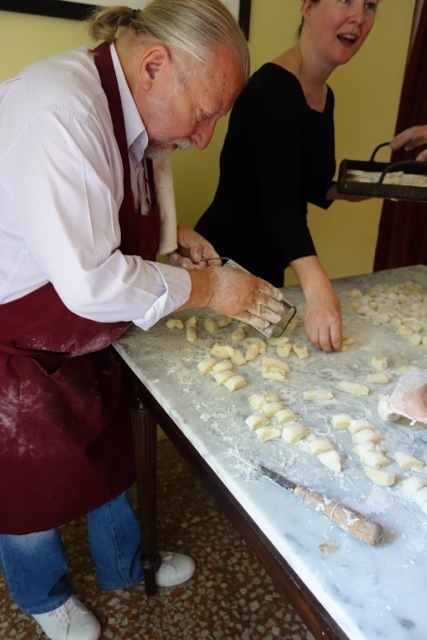 On the way they detoured up another mountain to buy carving tools from the ancient Milani factory in Pomezzana. This factory has been in the family for either 900 years or 9 generations – hmmm – our Italian is not that good! Nevertheless it is believed this same factory was making tools when Michaelangelo was in Pietrasanta. We visited this factory 30 years ago when we first went to Carrarra. In those days the factory was above the village and it is still there but now it has expanded and its extension is down on the road below the village. Its a wonderful experience seeing how these tools that have never changed continue to be made, though in slightly better conditions. In the meantime, Sollai created a beautiful carving for his collector. 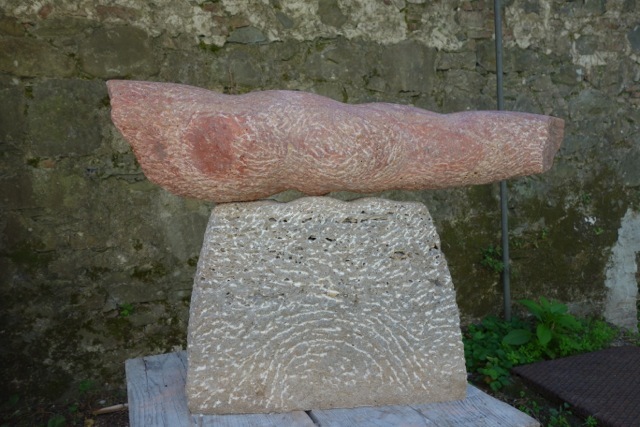 Its size came to about a 100 x 100 x 40 cm in a a beautiful soft dusty pink Portuguese Rose marble. 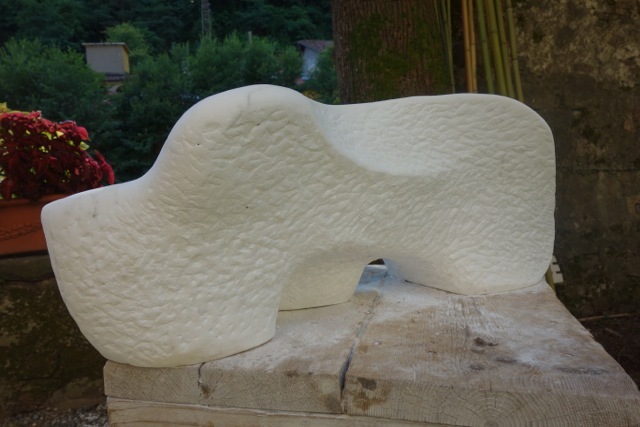 Sollai’s influences for his art are very organic and natural forms often found on one of his roving walks. 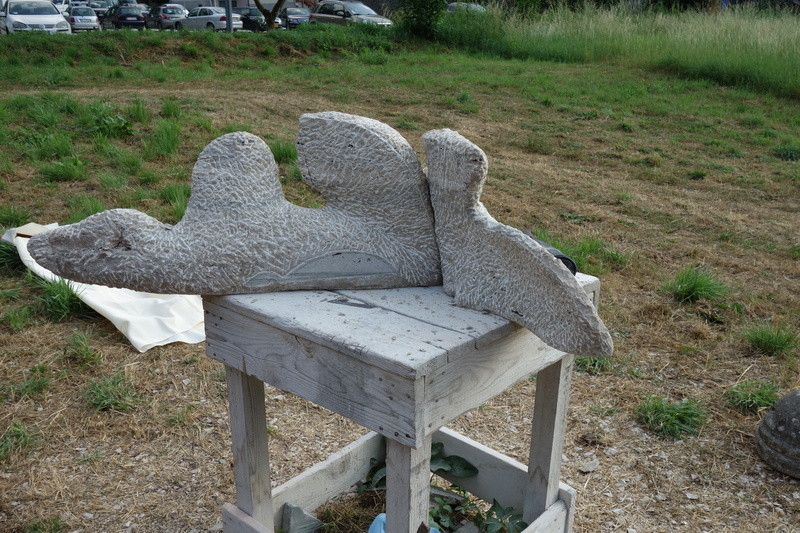 This piece is also organic but is also reminiscent of the Ligurian figure heads and they must have lain dormant in his head because he has seen them on his journeys back and forth to Italy since he was a teenager. Bagni di Lucca is set to host a brand new Art Festival this summer. 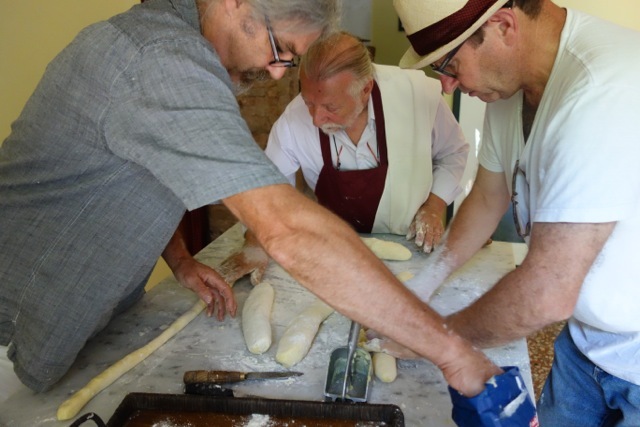 In the sunny months of July, August and September Ponte a Seraglio will be filled with performance artists, painters, sculptors and photographers. Meet part of the organizing team. 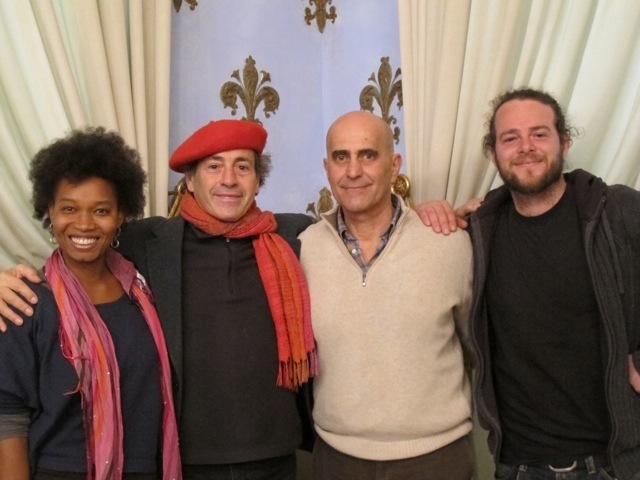 From the left…Jaqueline, Ira, our Sindaco Dottore Betti and Jake. 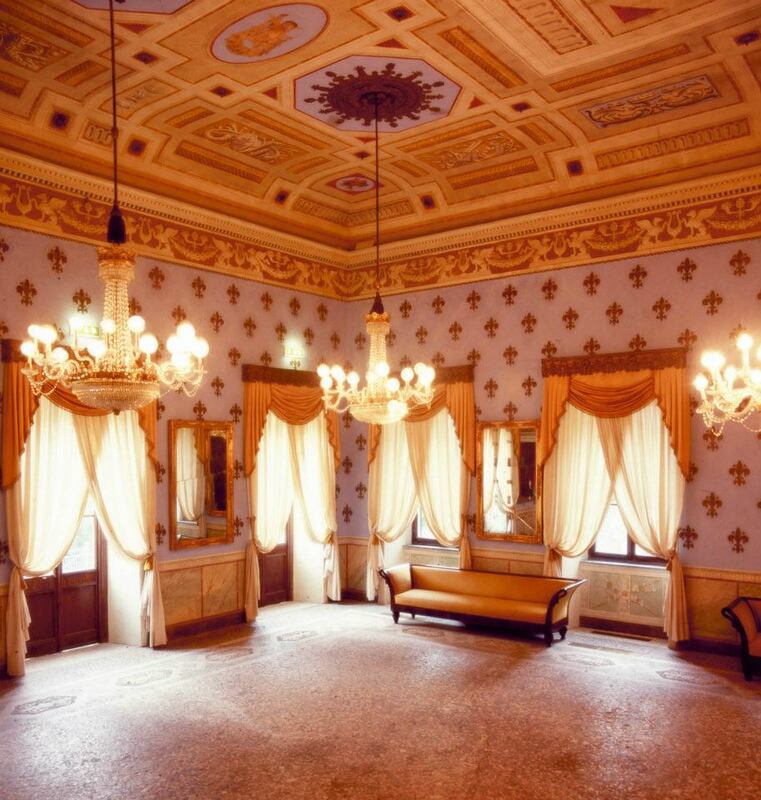 With the help of our Sindaco (mayor), our beautiful venues, such as the TeatroAccademico, the Casino, the Sala Parrocchiale and others will be filled with exciting performance artists. 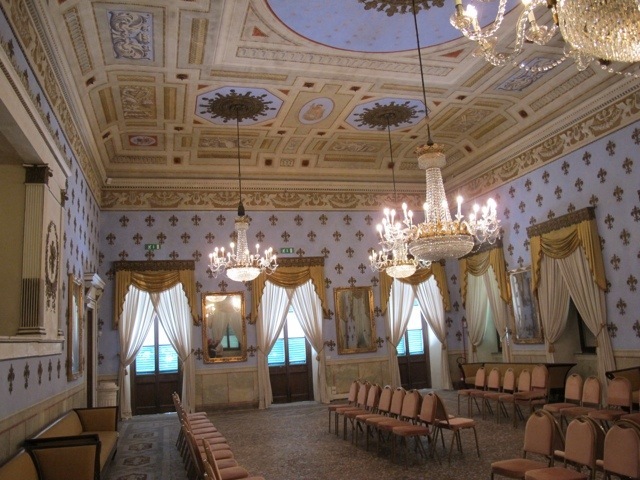 Click here to see more on the Casino and here for the Teatro Accademico. You are currently browsing the living in Tuscany category at Shona Nunan & Michael Cartwright.